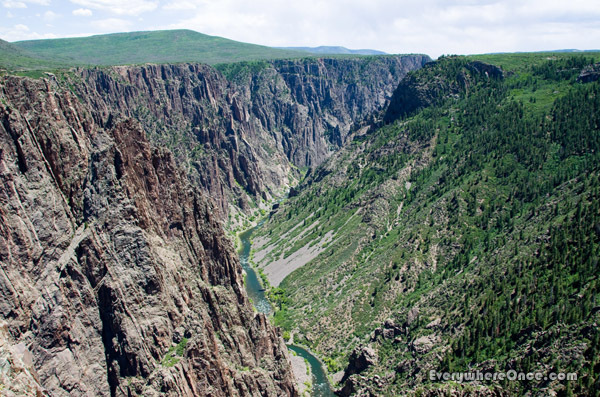 Cleaved by the Gunnison River over the course of two million years, the Black Canyon in Western Colorado is so deep and narrow that some areas rarely see sunlight. So forbidding are its chasm walls that no people ever occupied the gorge. Even today, access to the river and lower sections of the canyon are reserved for skilled watermen and climbers. Being neither, we happily kept to the miles of hiking trails along Canyon’s rim. You guys are following me again. I loved this place. You keep hitting on places we have been to. It brings back memories and my need to go back and look at my own photos … always fun. Great photos – some day, I will move there. Been having Colorado on my mind. Very cool blog. You are doing something we’re continually attracted to – just haven’t reached a critical mass of initiative yet! Really like reading about places I’ve not heard of but now realize I must visit. Glad we’re helping to stoke that wanderlust toward critical mass. Hi Erin. Everyone’s situation is different, but plenty of folks travel with children and pets. It may not be practical, but I wouldn’t rule it out either. Gorgeous photos, thanks for sharing them.